The present list comprises, for the most part, the earliest citations given in the Oxford English Dictionary (OED), although some additional headwords and other complementary material are included. Regular additions will be made, and an end-note explains how readers can help improve the list. Photograph caption: ‘Isaac Kashdan and Samuel J. [sic] Reshevsky (right), co-holders of the US Chess Championship, give a blitz preview of their forthcoming title match as they meet in the third round of the Rapid Chess Tournament.’ Chess Review, June-July 1942, page 135. ‘They played skittles, tournament, rapid transit, blitz and simultaneous chess.’ Chess Review, August-September 1942, page 155. See the separate Chessy Words feature article. See C.N.s 10576 and 10584. OED: ‘I almost imagined the author’s solution a “cook”.’ Westminister Papers, 1875, page 243. OED: ‘If there are two key-moves, a problem is cooked.’ The Field, 14 December 1889, page 854. For a detailed account of the early use of ‘cook’, as both a noun and a verb, see C.N. 4341. The first known occurrence of the term in a chess context was in 1851, but it is often difficult to know in which exact sense the word was being employed. A further item on the subject is C.N. 6460, concerning H. Staunton’s column in the Illustrated London News of 8 January 1870, page 55. Chess: Its Poetry and Its Prose by Arthur F. Mackenzie (Kingston, 1887), page 133. See C.N. 7607. OED: ‘You prevent him by pushing immediately your queen’s knight’s pawn upon his knight, which ... obliges the adversary to take your pawn en passant.’ Practical Chess Exercises by W.S. Kenny (London, 1818), page 106. ‘This is called “taking the Pawn en passant” or in passing.’ The Popular Educator (Oxford, 1767), page 64. See also C.N. 5092. OED: ‘When one piece can take another, that other is said to be in Prise of the first.’ Chess Made Easy (London, 1750), page ix. OED: ‘[He] had the privilege of taking such of the pieces ... as might be en prise.’ Kaleidoscope, 13 March 1821, page 294. ‘A piece is en prise when it is attacked and liable to be taken by one of the opponent’s men.’ The Popular Educator (Oxford, 1767), page 124. Regarding the phrase ‘to win the exchange’, as well as equivalent terms in other languages (Qualität, qualité and qualità) see C.N.s 7208, 7211 and 7226. OED: ‘Black’s present move, which the Italians call “Il Fianchetto di Donna” ...’ The Chess-Player’s Handbook by H. Staunton (London, 1847), page 379. The OED incorrectly gives 1848. See also C.N. 4556, which quoted another 1847 English-language source for the word fianchetto. See C.N.s 4592 and 4602. ‘But the French champion enjoys the game of chess too much to indulge in the “grandmaster draw” ...’ The Times (London), 9 January 1950, page 8. ‘... the number of so-called “grandmaster draws” can be counted on the fingers of one hand ...’ Prague 1946 ... by H. Golombek (Sutton Coldfield, circa 1951), first page of the Introduction. OED: ‘Another class of problems ... in which both players concur in endeavouring to effect the speediest mate ... which we term Help-mate Problems.’ The Problem Art by T.B. and F.F. Rowland (Kingstown, 1897), page 91. OED: ‘The Hyper-moderns are the greatest opponents of routine play.’ Modern Ideas in Chess by R. Réti, translated by J. Hart (London, 1923), page 122. OED: ‘What is claimed as hyper-modern turns out to be ... respectably medi[a]eval.’ BCM, September 1923, page 338. The same page of the BCM, the item being a review by P.W. Sergeant of Réti’s Modern Ideas in Chess, refers to Réti discussing ‘the school of the Hyper-moderns’ and also contains the remark ‘But this is scarcely hyper-modern’. The word ‘hypermodern’ also appeared in the Editor’s preface to the article, on page 253. OED: ‘Openings, ... Hungarian, ... Indian, ... King’s Gambits.’ The Hastings Chess Tournament 1895 by H.F. Cheshire (London, 1896), page 369. ‘Indian Defence.’ Chess Openings by J. Mason (London, 1897), page 92. A reference to 1 e4 d6. ‘The Indian Opening’ (heading to a game between Green and Paulsen beginning 1 e4 e5 2 d3). The note after 2 d3 reads: ‘Our efforts to trace this move to its inventor, by examining the various works treating upon the principles of the openings, have been fruitless. We find no mention made of it by either ancient or modern writers. Mr Green, however, informs us that this opening is common among the native players in Hindostan. We propose, therefore, to name it “the Indian Opening”.’ The Chess Congress of 1862 by J. Löwenthal (London, 1864). OED: ‘We now publish the names of those amateurs who have sent us the correct solution of our Indian problem.’ Chess Player’s Chronicle, 1846, page 96. ‘White has an “isolani”.’ My System by A. Nimzowitsch (London, 1929), page 187. Can earlier instances of the term be found, in the writings of Leonhardt, Nimzowitsch or anyone else? OED: ‘An isolated pawn is one that has no comrade on the same or either adjoining file, so that he requires the support of a Piece.’ Chess Exemplified by C. Pearson (London, 1842), page 27. ‘The isolated pawn is perhaps rather more than compensated by the forwardness of the pieces.’ Studies of Chess (London, 1810), page 208. OED: ‘If a player touch one of his adversary’s pieces, without saying “J’adoube”, he may be compelled to take it.’ A Treatise on the Game of Chess by J.H. Sarratt (London, 1808), volume one, page 3. ‘A piece once touched must be played, unless it be said, in touching it, J’adoube.’ Studies of Chess, volume two (London, 1803), pages 200-201. ‘White could save a Pawn by Knighting instead of Queening.’ Chess Player’s Chronicle, 31 March 1886, page 456. OED: ‘Two special lightning tournaments were held.’ The Year-Book of Chess 1910 by E.A. Michell (London, 1910), page 143. ‘Lightning chess. Played at Hartford, Sept. 9th, 1873, between C.A. Gilbert, of Brooklyn, and John G. Belden, of Hartford. Time of game, seven minutes.’ Hartford Times, 11 October 1873. See C.N. 4886. OED: ‘So that the reader may visualize the phases through which the game has passed we will show two historical cameos of living chess.’ Lasker’s Chess Magazine, July 1905, page 131. ‘... there was a large chess-board laid on the floor, and men and women, dressed as pawns and pieces, were in attendance for the use of those who might choose to play at what was termed “living chess”.’ Notes and Queries, 25 April 1857, page 338. ‘Living Chess. The ancient pastime of playing chess with living representatives of the chess pieces is again becoming very popular.’ American Chess Journal, February 1879, page 261. Note: A detailed paragraph on ‘playing Chess, with living men for the pieces’ was published on page 70 of the April 1875 City of London Chess Magazine but did not contain the specific term ‘living chess’. OED: ‘Nimzo-Indian Defence.’ CHESS, 14 November 1935, page 103. The OED citation was from an article by Tartakower. For the origins of the term (in German-language sources) see C.N. 3712. OED: ‘Immediately, spectators inquired, “Didn’t you see that win?” “Yes”, was the impudent reply. “But, with such a potzer, I draw when I will, not when he wills.’ Article by I.A. Horowitz, Chess Review, April 1948, page 5. ‘... I find that I’m the same old potzer as before.’ David MacDonald, Chess Review, December 1946, page 2. OED: ‘Removing his queen to obviate the “pin”.’ The Book of Chess by G.H. Selkirk (London, 1868), page 72. ‘If he move Q. to K. fourth, you answer with Q.B. to B. fourth, and then pin Kt., if he return with Q. to Q.B. sixth.’ A New Treatise on Chess by G. Walker (London, 1833), page 88. ‘A pretty so-called seesaw of checks finishes the game ...’ W. Steinitz, American Chess Magazine, September 1897, page 251. OED: ‘The self-mate, though not difficult, is very prettily conceived.’ Chess Player’s Magazine, 1867, page 45. ‘Self-mate’ (caption to a problem by Eugene B. Cook in Frere’s Chess Hand-Book (New York, 1858), page 312). ‘It is Sitzfleisch that decides a game.’ Letter from ‘Philidor Jones’, Chess Monthly, December 1881, page 113. See C.N. 4316. ‘Mr [Edgar] Pennell’s teaching is original in the extreme. Bystanders at Blackpool [i.e. at the British Chess Federation Congress in 1937] wondered at the strange terms such as “skewer” with which the boys interlarded their conversation. Explanations revealed that it was a term coined by Mr Pennell ...’ CHESS, 14 January 1939, page 212. OED: ‘Nor will our royal Game less royal sound, If shallow men play skittles on the ground, Where first-rate Chess sedately sits in state, And spends long hours accomplishing a mate.’ The Chess Player’s Annual for the Year 1856 by C. Tomlinson, page 61. ‘This game is of the description known as “skittling” among proficients.’ Chess Player’s Chronicle, 1846, page 2. OED: ‘White sui-mates in ten moves.’ Dubuque Chess Journal, November 1870, page 7. Page 401 of the Oxford Companion to Chess by D. Hooper and K. Whyld (Oxford, 1996) states that sui-mate was ‘first used by the American player Napoleon Marache (1815-75) in Chess Palladium and Mathematical Sphinx, 1846’. See C.N.s 9689, 9699 and 9714. ‘Black, by sacrificing Pawn, gains a tempo, bringing all his pieces into action.’ The New Chess Player, 28 August 1852, page 36. ‘The most ordinary “wood-shifter” by long study and analysis, can acquire a steady defensive style of wood-shifting ...’ Mr Blackburne’s Games at Chess by P. Anderson Graham (London, 1899), page 9. 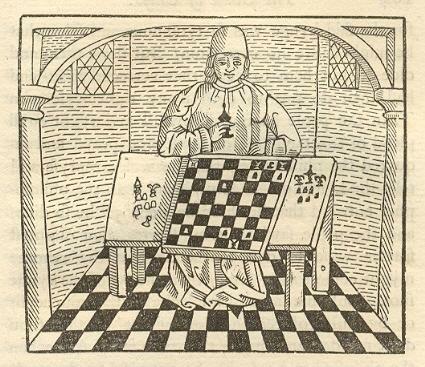 Such ‘wood words’ were discussed on pages 119-120 of Chess Facts and Fables. Moreover, references to woodpushing exist in Le neveu de Rameau by Denis Diderot. See C.N. 4325. A reference to Howard Staunton by the Earl of Mexborough in a speech at the annual celebrations of the Yorkshire Chess Clubs, as reported on pages 177-182 of the 1845 Chess Player’s Chronicle (with the cover date 1846). See C.N. 4543. Final stanza of a poem to Paul Morphy by Edwin J. Weller, Boston, 9 November 1857 in Chess Monthly, December 1857, page 367. ‘Morphy is comparatively a boy, but he stands today the champion of the world.’ American Union, 9 October 1858, page ? ‘... no man living can tell whether or no, these two gentlemen are not now engaged in fighting for the Chess championship of the whole world!’ C.H. Stanley in Harper’s Weekly, 9 October 1858, page ? ‘There is another type of double attack in which the targets are threatened in one direction. The attacking piece threatens two units, one behind the other, on the same rank, file or diagonal. This double threat has lacked a good descriptive name. We suggest “X-Ray” attack.’ Article by K. Harkness on page 25 of the Chess Review, April 1947. See C.N. 4245. OED: ‘White has struggled bravely and only loses by “Zugzwang”.’ Lasker’s Chess Magazine, February 1905, page 166. The correct date is 1905, and not 1904 as given in the 1989 edition of the OED. OED: ‘This masterly Zwischenzug is the finest move in the whole game ...’ Keres’ Best Games of Chess 1931-1940 by F. Reinfeld (London, 1941), page 108. Note: Earlier citations (primary sources, with all requisite bibliographical details) are welcomed, as are proposals for additional entries. Acknowledgments: Morgan Daniels (London), Robert John McCrary (Columbus, OH, USA), Russell Miller (Camas, WA, USA), the late Jack O’Keefe (Ann Arbor, MI, USA), John Simpson (Oxford, England) and Joost van Winsen (Silvolde, the Netherlands). Citations for various less common terms are presented in a companion article, Unusual Chess Words. Latest update: 3 October 2017.